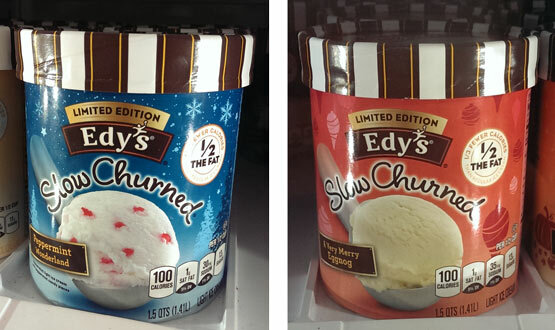 Greetings, and welcome to our Edy's (Dreyer's) limited edition, holiday flavor (did I mention we have free coupons?) extravaganza! I know, I'm a little late and big apologies to Edy's. I've known my wife for a long time and this is by far the craziest December we've ever shared. Oh well, you don't want to hear about my troubles because it's Christmas break for a lot of you out there, so it's time to relax and enjoy (and be glad the month is over). Now we are at the very beginning of that blizzard that has been ransacking the country, so now seems like a great time to break out three containers of ice cream --- mainly because we can't do anything else --- no, that's not fair, there is a house full of toys, books, games, dvds, so there is plenty to do, but I'm hungry!! Here they are! Three fresh pints straight from Edy's. We've got Hot Cocoa, Egg Nog, and Peppermint. Now I tried Hot Cocoa last December, I only rarely try mint things, and to be honest, I'm afraid of eggnog, hehehehe. My wife loves eggnog and always gets a half gallon at Christmas, but I never drink any.... strike that, I just tried a few sips of her Hood "golden" egg nog... ewww, not a big fan. I want to say it's overpoweringly sweet and it almost reminds of a super liquidy cake batter or maybe even cake batter ice cream. Ewww, she can finish that herself. I hope the ice cream is better! Whoa! That is some weird looking ice cream! I've never seen little pools of red soup before... you see how I resisted calling it something else? Now this over abundance of color does make me a little nervous, but at the same time, I am intrigued. Let's see how it tastes! Have you ever had those pillow puff peppermint candies? Not the hard, smooth peppermint candies, no no, the puffy, somewhat softer peppermint puffs. 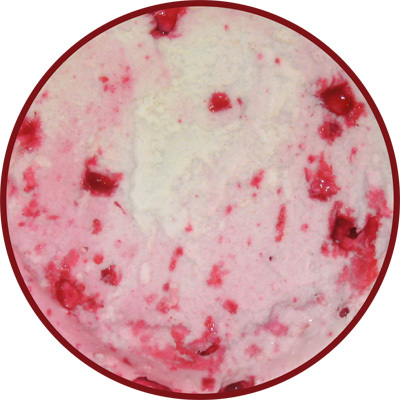 The puffs have got a good peppermint taste mixed with a bit of a gritty texture and I've always been a big fan. Well, this ice cream pops with that same peppermint puff magic! 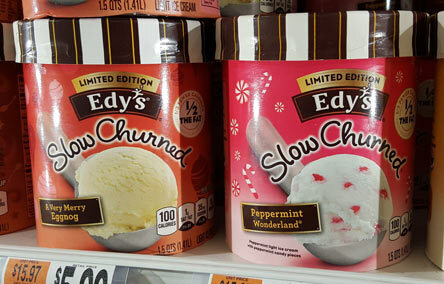 Very Cool Edy's! I may not want this all the time, but I am amused non the less hehehehe. The last one is hot cocoa, and I still feel pretty much how I always do. It's an ok chocolate with some chewy marshmallows in it. Just cause it's free doesn't mean I have to like it more than before. Ok, now I mentioned free coupons didn't I? 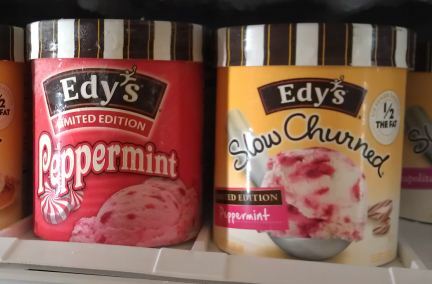 On top of these 3 free pints, Edy's has sent me 8 coupons to hand out, each for a free container of ice cream (ofcourse, they are good for Dreyer's too) -- Update: Winners are listed here - Thanks again to Edy's for the samples and for the coupons. In case you were worried, Peppermint is most certainly back for the 2012 winter season. In fact, there is now a grand version (red container) and slow churned version (yellow container). There is a 40 calorie / 5 grams of fat difference between the two. 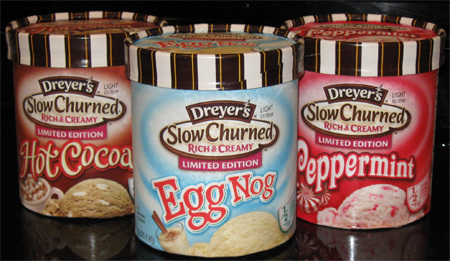 I haven't seen hot cocoa or egg nog yet, but I will check back in if/when I do --- hehehehe, I just realized that the slow churned packaging shows a much more realistic scoop of peppermint ice cream now --- Well, Egg nog came back, but Hot Cocoa never did! These are the fun new designs that go in line with all of other new limited designs that started popping up in 2013. The names have been upgraded to Peppermint Wonderland and A Very Merry Eggnog. --- It's 2014 now and Hot Cocoa still hasn't returned. 2015 : Eggnog and Peppermint are alive and well in their redesigned containers. Late 2017: It's not exactly Hot Cocoa, but Frozen Hot Chocolate is debuting for Holidays 2017. FHC adds a swirl of marshmallow ice cream to fancy things up. Well, I have to say that the Peppermint flavor is my absolute favorite. Since it's seasonal, I stock up during Yule with as much as my freezer can hold, and eat it down throughout the year. ...yeah, I usually only make it to spring. Good intentions, right? The Peppermint is awesome!!! I'll miss it when it goes! I love Edy's ice cream, especially cookies and cream, cookie dough, and vanilla! i'd rather have a house full of ice cream over a house full of toys, books, games, and dvds anyday. 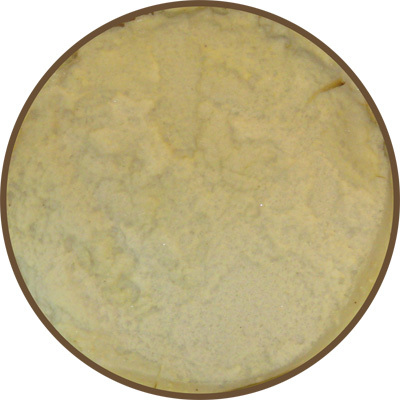 egg nog is somewhat of an acquired taste, only for us snobbish ice cream lovers with refined and exquisite pallets. wait, i'd probably eat ice cream if it fell on the floor. but i still like egg nog. there's something about that malty taste of the hot cocoa ice cream that appeals to me. perhaps because it reminds me of milkshakes. or perhaps it's just because it's ice cream. I liked the peppermint flavor a lot. I think it's one of my favorite flavors of ice cream actually. Thank you. and I had a feeling alot of people would like peppermint! I have tried every Edy's flavor and hands down they do make the best cookies and cream--even the slow churned is decent. 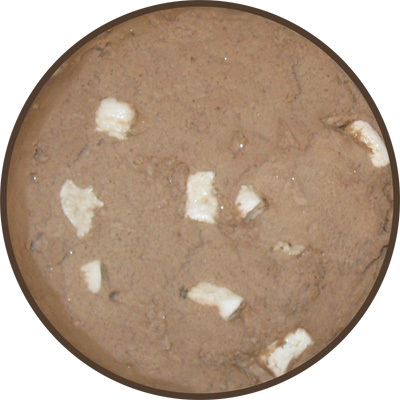 Biggest pet peeve is marshmallows in ice cream, so the Hot Cocoa and Rocky Road varities do nothing for me. Peppermint was a nice switch and I am definitely with you on the eggnog--unless you throw some sprinkles and cake in it, it's gotta go! The egg nog is sitting in the freezer now (I like it!) but I'm dying to give that peppermint a go! i've been meaning to try the peppermint one. they should make a peppermint/chocolate blend!